On the 7th of July, 2017 at about 2200hrs at No. 2, Jimoh Bolanta Street, Kulende Ilorin, Kwara State, the principal suspect and other suspects yet to be arrested armed with Barreta pistol stormed the shop of Mrs. Rasheedat Jimoh, shot her on the left side of her back targeting her heart and killed her in the process in the presence of her daughter and house help, robbed them of cash and other valuables before fleeing the scene. The deceased was immediately rushed to the Hospital where she was confirmed dead from the bullet wound sustained from the gunshot. Consequently, the Inspector General of Police directed the Special Tactical Squad and Intelligence Response Team (IRT) to conduct a discreet investigation into the incident and the circumstances surrounding the assassination of the innocent woman to arrest and bring perpetrators to justice. The joint IGP-IRT and STS teams relentlessly embarked on intensive investigation, trail and manhunt of the perpetrators which led to the arrest of one Ibrahim Aminu ‘M’, a native of Shagari Village, Shagari Local Government Area of Sokoto State and recovered in his possession a Barreta Pistol with Nineteen (19) Rounds of Live ammunition. The suspect, Ibrahim Aminu during interrogation made confessional statement to the Police investigation team, confessed and admitted to have fired the shot that killed Mrs. Rasheedat Jimoh. The arrest of the principal suspect, Ibrahim Aminu led to the arrest of two (2) other suspects namely: Saadi Abubakar ‘M’ 28Yrs a native of Funtua LGA of Katsina State and Oche Ellah ‘M’ 35Yrs a native of Otukpo LGA of Benue State. (i) Saadi Abubakar from Funtua Local Government Area of Katsina State during investigation confessed and admitted to be the owner of the Barreta Pistol which he bought at the rate Sixty Thousand Naira (N60,000) from Oche Ellah and gave to Ibrahim Aminu (Principal suspect) for criminal activities. (ii) Oche Ellah from Otukpo Local Government Area of Benue State confessed and admitted to have sold the Barreta Pistol to Saadi Abubakar for Fifty Thousand Naira (N50,000.00) and not Sixty Thousand (N 60,000) as claimed by Saadi Abubakar. He also admitted that he bought the said Barreta Pistol at Yongo village in Benue State through one Ugbede who is still at large. 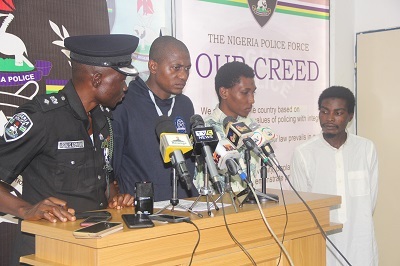 All the suspects have made confessional statements to the Police Investigation Team and have confessed and admitted to the various criminal roles they played in the killing of Mrs Rasheedat Jimoh in cold blood. Investigation is ongoing and efforts being intensified to arrest other suspects still at large. They will all be arraigned in court on completion of investigation.